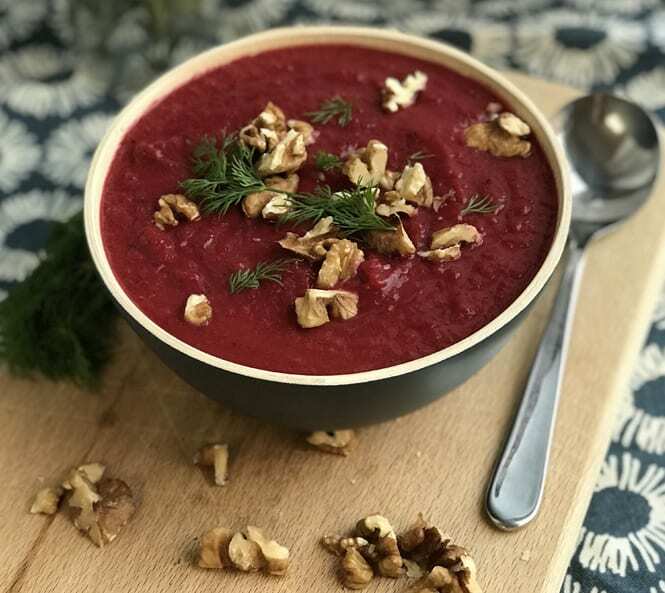 If you’re looking for something quick and easy that’ll provide you with plenty of vitamin A and C, look no further than our delicious Roasted Beetroot & Sweet Potato soup. It’s a delicious, healthy way to use our Garlic Roasted Sweet Potato in a new way while delivering fibre in a wonderful earthy flavour. You’ll stay warm and cosy on even the coldest of days! Cook the Roasted Beetroot Wedges and Garlic Roasted Sweet Potato Chunks as per cooking instructions on the pack. Add the preferred oil to a saucepan and heat for 1 minute. Add the onion and sauté with a pinch of salt for 5 minutes, stirring so nothing burns. Add in the cooked sweet potato and beetroot and stir for a few minutes. Add in the stock and water. Simmer for 30 minutes, then purée with a hand blender. Serve with a scattering of walnuts and dill.